Today during the last computer class for the year, the first grade students will practice logging into Arcademics using the website address (plus.arcademics.com) and entering their individual passwords. Then they will have the opportunity to explore the math games that they will use throughout the summer to practice math facts and money skills. 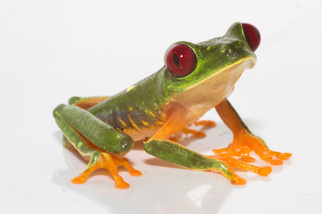 First grade students have finished their rain forest animal research and will use their computer class today to begin a computer project in Pixie. They will draw a picture of their selected animal and include an interesting fact that they have learned about the animal that they researched. Today students will be researching the animal they have chosen for their project. They will take notes about their animals, listen to the sounds their animals make, and watch videos of their animals in their rainforest habitats. The first grade class is learning about the Rainforest Biome in their classroom. Today students will have an opportunity to explore a website created just for them with great information about a selection of rain forest animals. This information will help them select an animal in which they are interested in researching for a classroom project. The students are finishing up the ABC book that they have been creating for the JK and K classes. Today they will record audio clips in which they read aloud sentences they wrote using the words they selected to illustrate each letter of the alphabet. The first grade class will begin a special project today: they will create an ABC book for the JK and Kindergarten classes. They will use PIXIE to create a separate page for each letter of the alphabet, practice creating text blocks and typing upper and lower case letters, selecting and typing a word representing each letter of the alphabet, and illustrating the word using pictures found in PIXIE. Students have been learning map skills in their classroom. 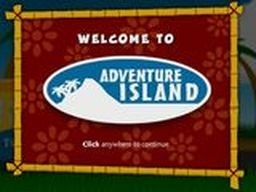 Today students will explore maps and map symbols while helping a tour bus driver navigate National Geographic's Adventure Island. 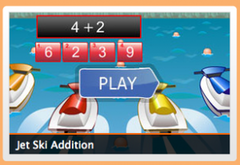 Since we still have time remaining on our free trial of Arcademics, today the students will practice more math facts while exploring additional math games..
We are currently doing a month long trial of Arcademics (ends March 23). Today I'm going to show the students how to access the games so they can play from home. Click here to access Arcademics. This week marks the 110th anniversary of Dr. Seuss' birth. Since 1998, the National Education Association (NEA) has designated March 2nd as Read Across America day. 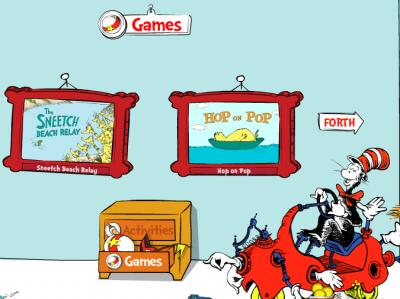 In honor of Dr. Seuss' birthday, we planned to play educational games and explore the Seussville website during our computer class. Since we had a "snow day" today we were not able to meet for computer class, but students are welcome to visit this site on their own.